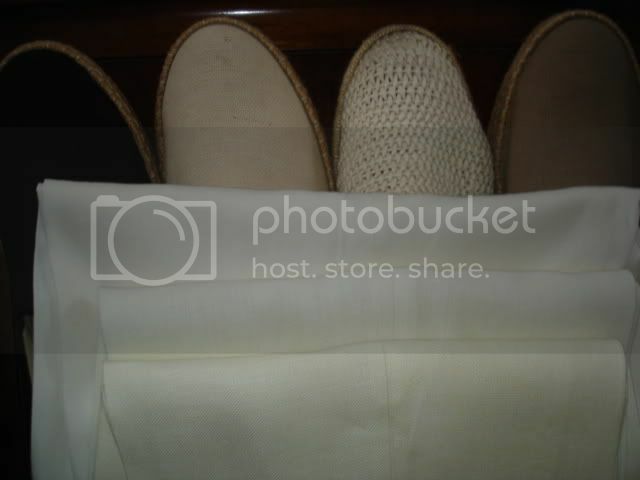 Accessorizing a white Palm Beach suit. Discussion in 'General Attire & Accoutrements' started by PADDY, Jan 8, 2008. 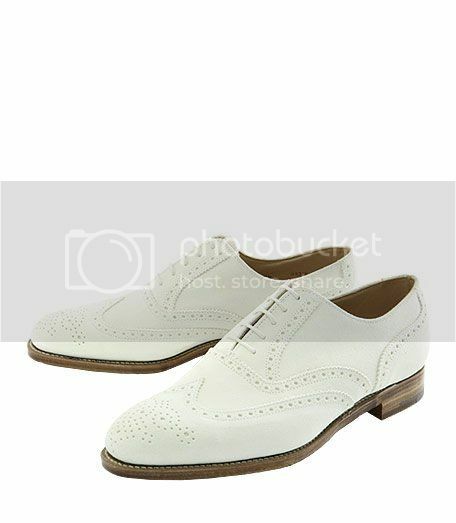 Here is a pair of 'waxed canvas brogues' in white that I am looking at buying to go with a white Palm Beach suit for the summer. I have been hunting around for a suitable pair of shoes. What is the opinion on these ? (first lookie, they seem pretty okay). Any other alternatives you can think of to accessorize such a summer look suit? Thanks ladies and gents PADDY. Paddy, the only issue is that it's canvase. They'll get pretty dirty. I don't know how easy it'l be to keep the canvas looking good. Have you looked at leather in white? (I had to pipe in here.) I'd look at 'em if I could find 'em. I used to see an all white suede summer shoe all the time. Never see them now. Know any good sources? Bucks! Bucs! Bux! Fruitboots! Pat Boones! Ice cream shoes! I'm sure you are familiar with Blanco... I'm not sure about the brogue style in canvas, though. Have you considered old-style Royal Navy tropical 'whites' (i.e. walking out shoes)? They have a more vintage look and are in white leather. If not, either spectators or bucks. Spectators with the mesh are good summery look. Hard to find though. If you get bucks, I would suggest finding a pair that is a little smoother and trim than most for a more vintage look, and if you want to go that far, replace the sole with leather instead of the crepe. Unless you can find leather soled. Paddy, what about the mesh spectators you already have? As for the rest of the accessories, a solid coloured shirt - the light colour of the suit allows a lot of latitude. Bring out the pinks, orange-tones, yellows, line greens etc for shirts. I like similar colours in a wide striped tie. Brown with white polka dot works well, too. Is that your final word...or did you just forget to add "ptooey"? How about a silky, pastel designer t-shirt and espadrilles...ala Sonny Crockett? I'd agree with Baron. Cap-toe spectator / co-respondent shoes are the unspoken de rigeur for a true Palm Beach suit. Ditto a Palm Beach tie(they didn't make just suit fabrics, remember) in a pastel color. White bucks are a good option as well, but as was pointed out, they're tough to find. I'd personally avoid them as they're a pain in the rear to keep clean. Regular white leather shoes would be a good alternative, but again you're going to be fighting the cleanliness issue...hence the reason spectators were invented in the first place(I'm likely preaching to the choir here). For the more casual sporting look, an ascot and open collar is appropriate, although it might look a bit out of place with a DB suit. Don't forget a bamboo cane. Not sure of the norm with regard to french cuffs(and thus, cufflinks) while in summer wear, I'd assume it would be a bit confining and warm, and a bit more formal than necessary. I've done it before. Pat Boone, eat your heart out. No. If been asking our pals at Allen Edmonds to bring back white Bucks. They don't want to. I can't convince them to (And I make clothes for some of the owners of AE shoes). I think that Foot Joy still makes them. I wonder if Walkover still makes them. 1. You presume Pat Boone has a heart. 2. Then I say "nertz" to AE! Dare I suggest J&M or, perhaps, Alden as alternatives? Either in Left or Right hand should do. Paddy - what size shoe do you wear? I bought a pair of white buck shoes on US eBay which were listed incorrectly as a UK size 9, when they're at least a UK 10. It would have cost a lot to send them back, and I thought I could pad out the toes if I ever wanted to wear them, but I've never bothered. They're unworn, apparently former Canadian navy dress shoes, in mint condition. If they're your size, and if you like the sound of them, you can have them for ¬£40 including postage. I've just remembered that Marc started a thread about these very shoes. I used to see an all white suede summer shoe all the time. Know any good sources? How about a silky, pastel designer t-shirt and espadrilles...ala Sonny Crockett? What? Did I say something wrong? 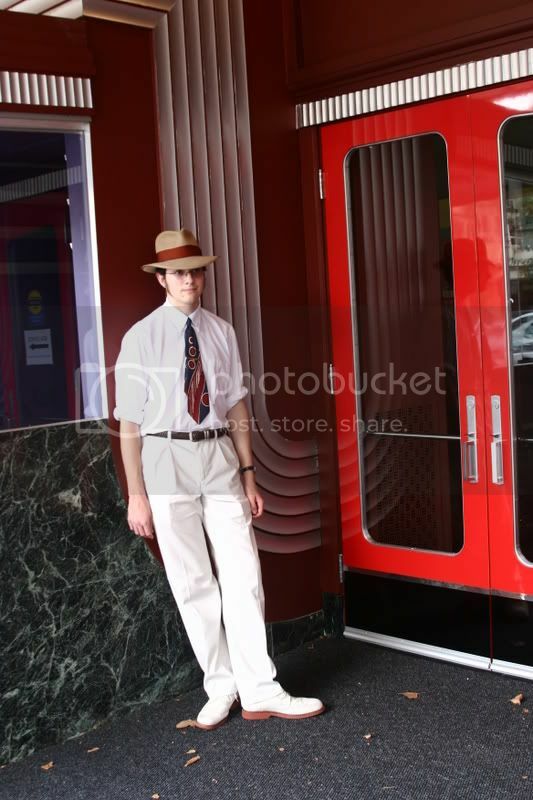 Not a huge fan of t-shirts with suits But I'm a big fan of espadrilles, worn with linen and seersucker suits sans tie and socks. I've worn these with my summer white suit. The Brennans also come in saddle and penny styles. I know I've owned Cole-Haan and Tommy Hilfiger white bucks in the past; I'm looking for a new pair (got bested in an Ebay auction recently). It's true they're a pain to clean, but this gives you an excuse to buy a little "bunny bag" of white talc and pat the dark smudges on your shoes, which is kind of fun. Since everyone else is saying white... I'm gonna have to look the other way since you asked for other ideas. Why not light brown/tan brogues? In suede or pebble grain calf, they'd look excellent with any white suit, IMO. Just make sure your belt is brown or suitably casual. * Mr. Mathis' come to mind. *I personally think a navy web belt with polished silver buckle looks great. Bucks are great shoes, although a bit hard to keep clean. 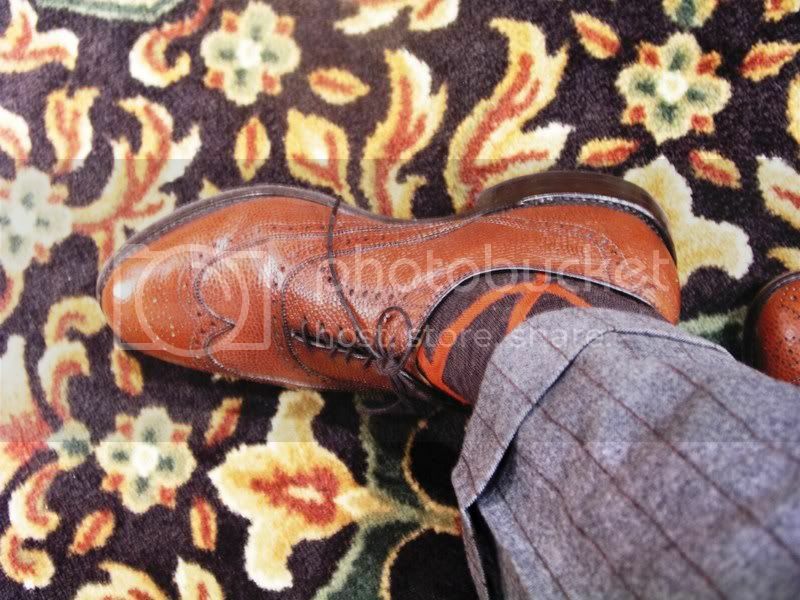 I've got myself a pair of wingtip ones made by Bass.